Our guide takes you to the lake by the boat. 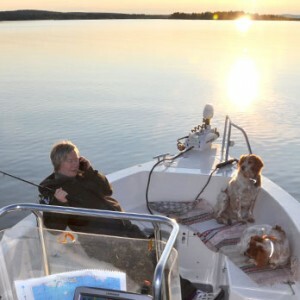 The beautiful lake nature of Kemijärvi and Eastern Lapland fell landscape provide a magnificent setting for your tour. On the way your guide tells you about the area`s nature and history. You can try to catch fish and sametime get good tips for fishing because your guide is also a professional fishing guide. During the day you`ll have a break with coffee/tea by the campfire. Lunch you will enjoy in an peaceful island in a Finnish summer cottage. If you have been lucky in fishing, you can make a lunch together with the guide from yourself caught fresh fish! In the cottage you have a possibility to relax in a traditional Finnish Sauna and freshen by swimming.